What’s that logo all about? Recently I was asked about the design of our logo and where the idea came from. It’s very simple – all I wanted to do was to symbolise what it it feels like to be the person running a small business!! I reckon it couldn’t get any more descriptive than showing someone juggling a heap of jobs and roles at once. – I’m sure you get the picture. Just keep tossing those balls up in the air…. ….. and that’s where we come in, to help you and your staff learn some new skills or to help cover those areas of the business that you are too busy to get to. 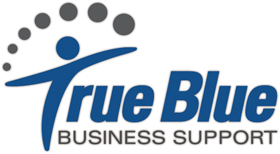 If you’re juggling whilst standing on a tightrope, maybe True Blue Business Support can be your safety net?